What happens when we devote our lives to service. 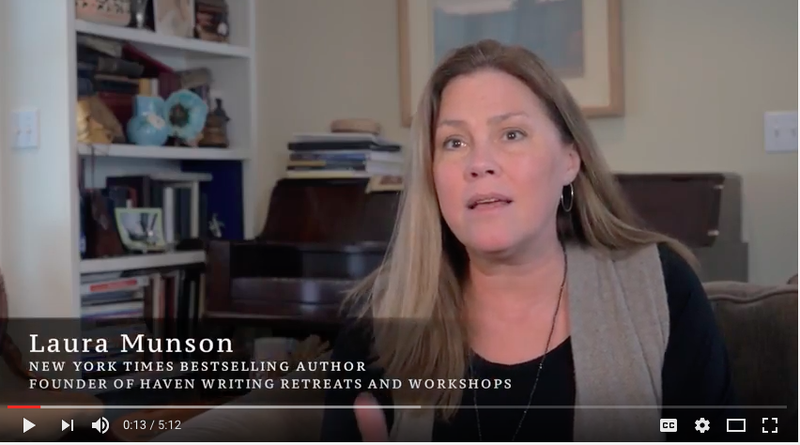 Laura Munson, New York Times and international best-selling author, speaker, and founder of Haven Writing Retreats. It happened one day, a very bad day, when my world was being met with rejection on every front — marriage, career, teens… And I sat in my office staring at a blank screen, thinking, Why do I do this writing thing with such devotion and fervor, and for so many years? Nobody asked me to do it. It’s financially counter-intuitive. And it’s damn hard! And out of my fingers poured these words: “I write to shine a light on a dim or otherwise pitch black corner to provide relief for myself and others.” There it was: Service. Service to others. And service to myself. Huh. My career started approximately 24 hours later. You see, that one line was the defining moment when I held the mirror up to my heart, my intention, my intuition, my passion — everything that drove me…and staked my claim on it all. This is what I’m made of, and why I can continue my writing life, regardless of promises. That was my service to self: getting perfectly clear about what makes me tick. And so it makes sense that in only five years, I was not just writing out of service from my little office in Montana, but actually sharing what had held my muse with hundreds of people in my neck of the woods. People from all over the world, coming here, to work with me, and be of service to their muses. And yes, consequently, to others, in community, and with all laud and honor to the written word. The ripples of have been the most life-affirming endeavor I’ve known outside of motherhood. And this branch of my career has stabilized my life and brought with it great richness, and opportunities. But there were a few missing pieces in my business that required help. Big help. Help I had no idea how to ask for. So I didn’t. In a symphony I could never have orchestrated, one of the attendees made a phone call, and the next morning she showed up with two videographers who’d driven two and a half hours in a snowstorm. They set up professional lights and cameras on tripods. All I had to do was straighten a few pillows and put a little make up on. And the rest of them arrived, smiling and beaming. I could go on and on about the blessing of that day. The gratitude circle that one of them suggested — the way each of them honored each other, one by one, sharing words of thanks. How they each offered testimonials and discussed what makes Haven so special. I have never been more speechless, more touched, more grateful. Originally published at blog.lauramunson.com on April 27, 2017.